Get a Real Truck with a Real Price! Heavy Hauling Quote is the one source for all your transportation needs and we have developed a system that accommodates all your equipment types. Our main concern is to maintain superior transportation, on-time scheduling, as well as a good working relationship with our clients. We are a Flatbed, Heavy Haul, and Specialized Trailer Trucking company that can help you with any of your Heavy Haul freight hauling needs. If you are looking for a Flatbed, Heavy Haul, and Specialized Trailer Trucking company, you have come to the right place. We have the right equipment and experienced staff that can accommodate all of your freight shipping needs. HeavyHaulingQuote.com can get you affordable transportation without all the nonsense! Whether you need a truck in 30 minutes or 30 days, we can arrange transportation to suit you, 7 days a week, 365 days a year! We know you’re looking around at several hauling companies—well look no further! Our company is determined to provide you with the best service in the business! We take pride in the system we have developed to provide prompt on-time pickups and deliveries. We strive to maintain our reputation of providing Superior Transportation and Customer Satisfaction and building Great Working Relationships. Along with reliable service, our freight carriers are required to carry cargo insurance certificates for the full value of the freight being moved. With our company, we take the stress out of your life to provide a hassle-free experience to your logistical needs. Our company is one of the best hauling companies in the business! It was designed to accommodate all types of shipping needs. We have trailers and equipment to haul anything from LTL (Less Than Load), Full Loads, or Heavy Equipment hauls. We also have equipment available for customers who need shipments Refrigerated or transported in Dry Vans. 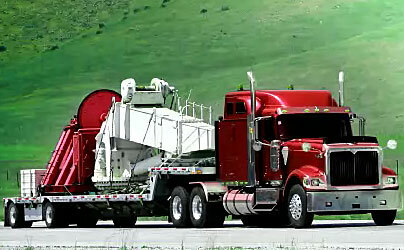 HHQ is your full-service heavy equipment hauling company. We offer personalized service, on-time delivery, and low rates. Contact us and let us help you with all of your midsize, overweight and oversize loads.